As many of you know by now, my father-in-law is an avid Napa Valley enthusiast, and has quite the extensive wine cellar. On a recent visit to Napa, he had the privilege of not only touring a couple of the vineyards that partner with Three Clicks winery, but also participating in one of the harvests. I was excited to enjoy a bottle of the 2011 Petite Sirah since it has a rather limited production release of only 125 cases. 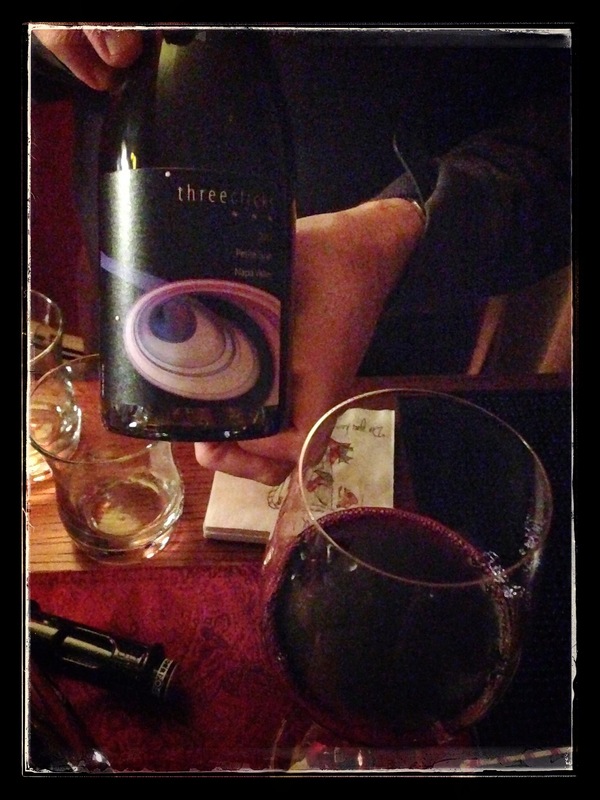 Three Clicks is a collaboration between winemakers Bruce Devlin and Dirk Hampson who share a philosophy to craft the “best quality wine from premium vineyard sources in the Napa Valley”. Their vision is to make the kind of wines they want to drink, and then be able to share them with everyone else. The name Three Clicks honours journalist Harry Allen Smith, who reportedly “bribed a telegraph operator to send a “three-click” advance warning just before sending out the message that Prohibition had been repealed”. He was therefore able to become the first American to legally drink an alcoholic beverage after the Prohibition repeal in 1933. The grapes for the 2011 vintage were sourced from 2 small family vineyards in Calistoga, the Citron vineyard and Gary Branham’s Obsidian vineyard. The winemaker states that it can cellar for 10-15 years, however, “our preference is to drink them younger and more fruit forward in the 6 month to 2 year window”. Dark red-violet in colour with aromas of cherry and earthy minerals. Blueberry, cranberry and tangy cherry fruits ran atop an earthy undercurrent, whilst toasted oak and traces of baking spices comprised the moderate finish. A refined and easy drinking glass with a fantastic balance of fruit, spice and invigorating tartness, each sip will keep you reaching for more.